myJINI is a connected car service and provides insight in driving behavior through the myJINI connector that is installed into the OBDII port of the car. 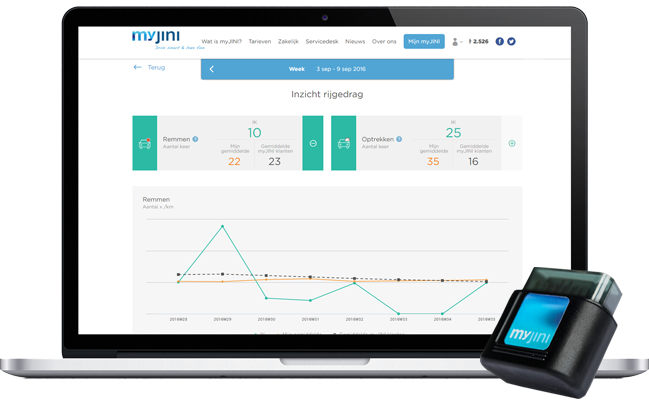 myJINI works for a lease car, company car or private car. The customer gets insight through a dashboard app (iOS and Android). myJINI also offers a trip registration tool to easily sort al business and private trips. myJINI also focuses on employers. The service provides customized reward programs where efficient and eco-friendly driving is encouraged within the company. For example, to reduce CO2 emissions or the total mileage of the vehicle fleet. Know more about myJINI for employers? Please visit our website (DUTCH).